Throughout this 365 drink-per-day challenge, I’ve tried to avoid recipes that are simply [insert alcohol] and [insert mixer]. It pisses me off when liquor companies run ads promoting recipes for their drinks and they’re so basic. I get it; you don’t have time to list a never ending set of ingredients, but at least give me something a little more substantial. That all said, you simply can’t have Gin Week without making a good ol’ fashioned Gin & Tonic! The libation was actually created in Holland, not England, where it is often associated thanks to all of the London Dry Gin companies (Beefeater, Gordon’s, Plymouth, etc.). In fact, gin’s name comes from the Dutch word for juniper, jenever. Juniper is a key ingredient in gin production and gives it that pine needle taste. Gin is meant to be mixed with other ingredients, which help the spirit come to life. 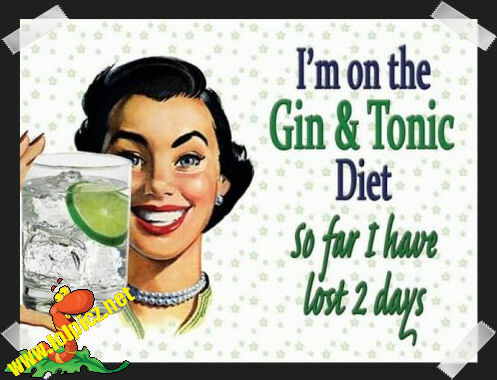 I remember shooting gin when I was a lot younger and while it would get you drunk, it was not the tastiest of liquors. The alcohol was once public enemy #1, as in its earlier years it was often a poisonous blend of ingredients made by cheap distillers. Many poor Londoners died from drinking gin and the death rate was higher than the birth rate in the slums of the city. And we all thought Jack the Ripper was evil. Keeping gin consistently badass, it was a very popular liquor during Prohibition because it could be manufactured anywhere, like in a bathtub, and didn’t have to be stored or aged in barrels. 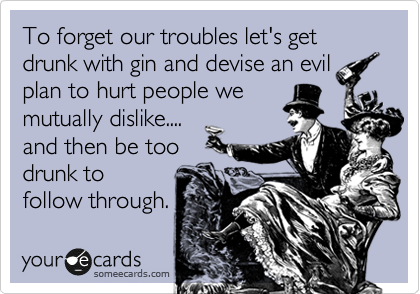 I bet Ernie and his rubber ducky wouldn’t mind having a soak in a Gin-filled tub… at least I wouldn’t mind. I happen to think I would have done well during the Prohibition Era, whether as a gin joint operator, bootlegger, distiller, etc. Just give me one of those wicked tommy guns and let’s rock! The Philippines is the world’s largest consumer of gin. The gin & tonic drink is popular in tropical regions because gin was traditionally used to mask the taste of quinine, which happens to be the cure for malaria and is now also the key ingredient in tonic water (get it? hence the name tonic water). Unfortunately, the amount of quinine in tonic water today is so minimal, you would have to drink about 67 G&Ts per day to get enough of the tonic in order to actually prevent malaria. Gin used to be the main ingredient in many popular cocktails, such as the martini, but thanks to Smirnoff Vodka’s very successful ad campaign “Vodka leaves you breathless”, vodka has often been substituted for gin. Further cocktails have also seen gin removed in favour of other spirits. Finally, there is some controversy over the garnishing of gin-based drinks, particularly today’s recipe. 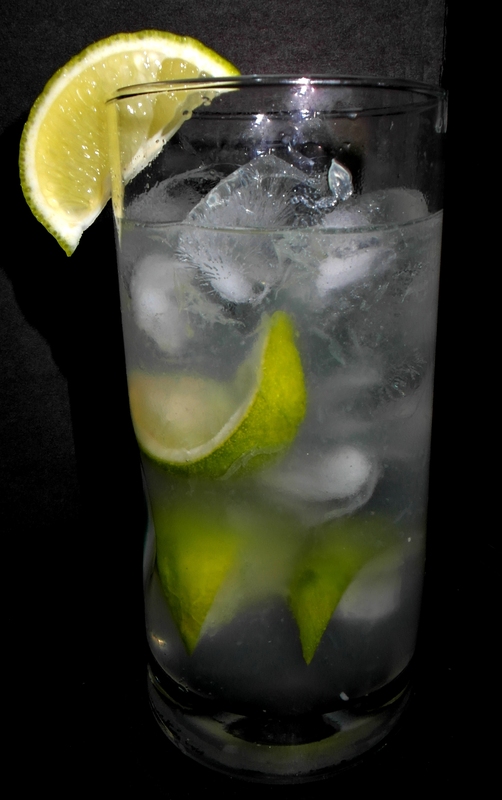 While most mixologists insist that a lime be used to accentuate a G&T, in some places, such as the United Kingdom, lemon wedges are sometimes substituted. Some experts have attacked this substitution, calling it an “uncultured alternative”. Poor little lemons… what did they ever do to earn so much ire? (except give people canker sores). So, even with a very basic recipe, I found a way to spice it up a little with some muddled lime. I always forget how much I dislike Tonic Water until I make a G&T and then it all comes back to me. Once again, I have sacrificed myself for the good of all Sip Nation! This is a solid drink, but I’ve never been a huge fan of tonic water. What helped make the concoction a little more palatable was muddling the lime wedges and leaving them in the drink to counteract against the beyond bitter tonic. This entry was posted in Crazy & Classic Cocktails and tagged Beefeater, cocktail, England, Ernie and Rubber Ducky, Gin & Tonic, Gordon’s, Hendrick`s Gin, Holland, Jack the Ripper, lemon wedge, lime wedge, London Dry Gin, martini, Plymouth, Prohibition Era, Smirnoff Vodka, The Philippines, Tonic Water, United Kingdom by Daniel Wilson. Bookmark the permalink.